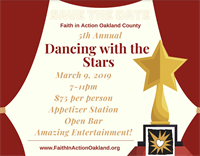 The Fifth Annual Dancing with the Stars Fundraiser to support Faith in Action of Oakland County will be held on Saturday, March 9, 2019 at the San Marino Club. Funds raised will support the Mission Possible project to help repair homes for the low income elderly and disabled population in Pontiac this summer. All Oakland County High School counselors are being asked to help find 11th & 12th-grade students who could bene?t from this program. They will participate in a 5-day work camp to help repair 35-40 homes. All of Oakland County will be involved. Home Depot is currently the biggest contributor of supplies and volunteers. For more information visit www.faithinactionoakland.org. This is a special invitation to you to ask for your support for this major mission that we expect will bring National attention to our county. We are asking for sponsors at this time. On our website is Sponsorship information. Please consider being one of our Premium Sponsors. This will be Oakland helping one of its own as well as our youth who will benefit greatly from this experience. Currently, our local media will be covering this mission.